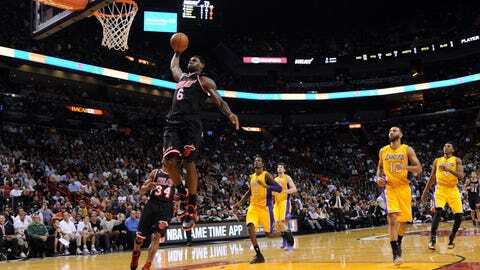 Miami Heat small forward LeBron James (6) dunks the ball during the second half. MIAMI — No Dwyane Wade. No Kobe Bryant. No Steve Nash. Still, the Miami Heat and Los Angeles Lakers provided an entertaining finish in a nationally televised game at AmericanAirlines Arena on Thursday night. The Heat, who led by as many as 16 points early in the third quarter, held off the refuse-to-surrender Lakers 109-102. L.A. got as close as four points with 4:09 left, but then scored one point in the final 2:04 after pulling to within 106-101. Chris Bosh scored 31 points on 15-of-22 shooting to lead the Heat (31-12). LeBron James, who before the game found out he was the largest vote getter in earning an All-Star Game start for the Eastern Conference, had 27 points and 13 rebounds. 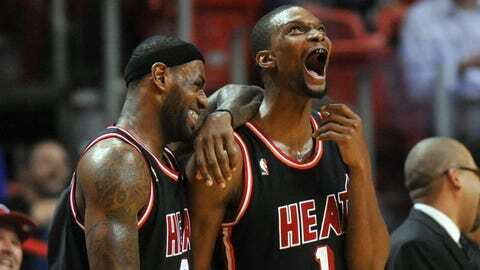 -- Chris Bosh and LeBron James help the Heat lead wire-to-wire in their win over the Lakers. Wade, who joined James in being named an Eastern Conference starter, missed his fourth straight game to rest his knees. Greg Oden, who made his home debut in Tuesday night’s win against Boston, played in both halves. He finished with five points, five rebounds and a block in 10 minutes, 26 seconds. Pau Gasol and Jodie Meeks each scored a 22 points for the Lakers (16-27). The Lakers scored the first five points of the fourth quarter against Miami’s second unit to pull within 85-80 with 9:46 remaining. Bosh re-entered after a timeout, and immediately sank a jumper to open up a seven-point cushion. Bosh had 13 points and James added 11 point and eight rebounds to help Miami build a 57-46 halftime lead. The Heat shot 56.8 percent (25 of 44), outscored L.A. in the paint 38-18 and won he first-half boards battle 28-19. -- LeBron James says it is too early for him to decide whether he will play in the 2016 Olympics. 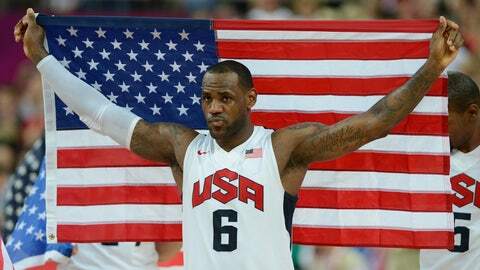 -- LeBron named to Team USA pool. Heat newcomer Toney Douglas joined Wade as Miami’s inactives. Give the Lakers credit — they fought back to put a scare in the Heat. But Bosh’s jumper with 54.4 seconds remaining gave Miami a 108-101 advantage. After Kendall Marshall missed a 3-point try, James sank 1 of 2 free throws to create an eight-point cushion with 22.8 showing. Bosh. Not only was he the game’s high scorer, he scored 10 points in the final period. Twice he sank jumpers after L.A. had gotten within five points. Rebounding hasn’t been the Heat’s strongsuit this season, yet Miami outrebounded L.A. 48-35. The Heat will play the third of a four-game homestead on Sunday against the San Antonio Spurs at 1 p.m.